Two veterinarians have received awards from the British Equine Veterinary Association for their work in equine health research. The pair won the awards on the merit of their presentations at BEVA Congress, which was held in September. BEVA presents a series of awards each year to some of the profession’s most outstanding contributors to equine veterinary science, health and welfare. David Rendle won the Sam Hignett Award for his work looking at a palatable pergolide paste formulation for the treatment of pituitary pars intermedia dysfunction (PPID) in ponies. Rendle noted the poor palatability of the licensed treatment for PPID, a pergolide mesylate tablet. Accuracy of dosing the drug is also limited when tablets have to be split. “Alternatives are needed but pergolide is an unstable molecule and new formulations need to be evaluated critically,” Rendle said. In his paper Efficacy of a novel palatable pergolide paste formulation for the treatment of pituitary pars intermedia dysfunction (PPID) in ponies, Rendle treated 19 ponies who had not responded to the licensed pergolide tablet with a palatable pergolide paste, and the analysed clinical and endocrinological data. PPID was diagnosed based on clinical signs and adrenocorticotropic hormone (ACTH) concentration. 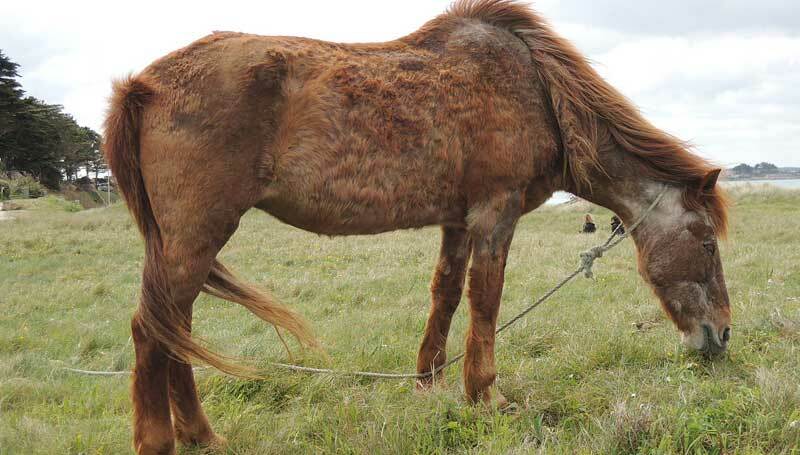 Rendle found that ACTH concentrations improved significantly with treatment in 14 of the 19 ponies. The paper outlined the difficulties of administering tablets to horses, particularly when the dose is only a fraction of a tablet. It also explained that horses might respond better to treatment if smaller amounts of pergolide were administered twice daily rather than once daily. The new pergolide formulation overcomes these issues by allowing accurate administration of very small volume of molasses-flavoured paste produced specifically for horses. His work was the first to demonstrate that the new paste formulation was effective and was not associated with any side-effects. “Although pergolide paste is available in the UK through veterinary surgeons it is not a licensed medicine and needs to go through a proper registration process in order to become licensed,” Rendle said. Rendle is a specialist in equine medicine at Rainbow Equine Hospital and was selected for the Award from those presenting Clinical Research papers at BEVA Congress 2018. Part of his prize is free registration to next year’s AAEP Annual Convention. Adam Redpath won the Voorjaarsdagen BEVA Award for his paper Aminoglycoside Antibiotics; still essential in equine practice? Broad spectrum aminoglycosides — Gentamicin; Tobramycin; Amikacin — remain widely used, especially in specialist clinical practice. Redpath said restrictions on aminoglycoside use would have significant impact on clinical practice. “Opportunities exist to enhance stewardship relating to aminoglycoside antibiotic use including development of a guideline on prudent use,” he said. Redpath is a Clinical Teaching Associate at The University of Nottingham working at Oakham Veterinary Hospital. He is working towards specialist status in Equine Internal Medicine, also studying towards a PhD in equine analgesia and European Diploma in Equine Internal Medicine. His prize is free registration to Voorjaarsdagen Congress 2019 where he will have the opportunity to present his paper again. The Voorjaarsdagen and BEVA Awards mark the close relationship between the two Associations. The two awards are selected and presented biannually, once at the Voorjaarsdagen Congress and once at BEVA Congress.